Sometimes a musician reaches a point in his career where he feels the urge to break out of the creative box he’s built around himself. That may have been the case in 2011 for Matt MacDonald of The Classic Crime. Recently finished with Tooth & Nail Records, The Classic Crime was now independent. Left with unpaid bills and their first child on the way, Matt and his wife Kristie teamed up to form Vocal Few. The husband and wife duo found success with their debut release, She’ll Be Right, followed by the beautiful, Tall Trees EP in 2014. Now with the bills paid and some degree of financial security for their ever growing family, the MacDonald’s are set to deliver their latest, and greatest EP. The first offering from The Dream Alive, “The Corner Dwellers” rightly bears comparison to Sufjan Stevens. The sound of car tires on a wet road, an acoustic guitar, string elements, a lightly keyed piano, layered with soft harmonies. But what drives this song are the words. The poignant lyrics can be rendered into so many differing viewpoints, and they’ve brought forth deep emotions from this reviewer. Simply stated, “The Corner Dwellers” is the greatest song of the year. the cars pass by, and so does a normal life, why are we left behind? as our dreams die, we got so much more in common with the corner dwellers. The melancholy air continues with “Time”. The age old blessing and curse of mankind is time. This song asks whether a couples love can surpass the breadth to time to remain true to the end of life. “Take Me Back” carries lilting vocals, and a picked guitar adding a touch of country music flavour. The lyrics also carries the tone of a country music song as a man recounts his love for his wife, and regrets how succumbs to hard drinking at the end of the day. nothing in me is good, nothing is true, will you ever take me back enough for me to stay new? you just love me, and take me back again. Seeking to make the best of each day, creating memories in the moment, whilst leading a carefree existence is the essence of the title track “The Dream Alive”. This light, pop inspired track is destined for continuous radio air play, yet remains the weakest song on the EP. The remains too simplistic and fails to grab the heart. “You’ve Been Written” finds a free-spirited male discovering his future spouse. The two become one as they draw a levelled emotional plane for their relationship. Matt and Kristie equally share the music roles on this song, which is bound to go on be a wedding reception favourite. The Dream Alive, closes with yet another stand out song. With rapid acoustic guitaring, Matt takes primary vocal duties on “Blue”. The lyrics tell the story of keeping love alive in spite of trials. But everything changes when you bleed blue. On first listen, musically and vocally, The Dream Alive comes across as light frosting on a cake. But lyrically the truth comes out. Delving into a deep look at various facets of love and relationships, The Dream Alive, contains a gentle reminder that life, love and dreams may not always be the fairy tale we desire. 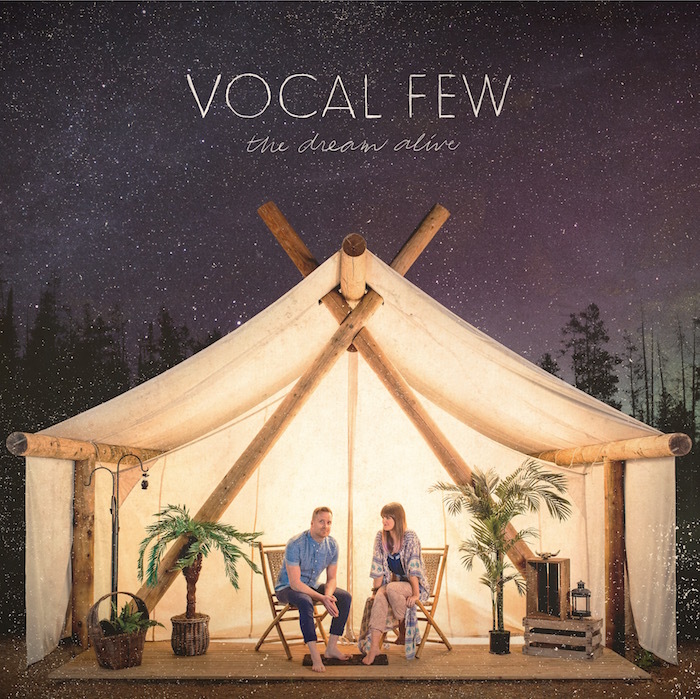 One Response to "Vocal Few – “The Dream Alive” review"